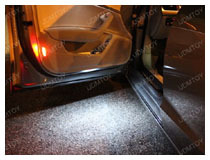 The purpose of the side door courtesy light is to provide you lighting while you get in or out of your car and let oncoming cars know that the door is open. We carry various side door courtesy bulb sizes of T10 (168, 194, 2825, W5W) to festoons in 36mm (6411, 6418, C5W) and 42mm (211-2, 212-2, 562, 578). Courtesy lights are not always a safety requirement, but they are beneficial in many ways, and certainly are important features to any vehicle. If you ever are driving at night and have to pull over, or are parked on the side of the road, it is important for other vehicles to know that the door is open that way they can avoid an accident. In addition, it is nice to have a pair of lights when you are stepping out of your car at night so you can avoid stepping in a large puddle, or on anything else like a nail. Our LED side door lights are perfect for adding this ease and safety. Whether you are looking to modify your vehicle, or just replace a bulb that has burned out or is barely burning, we have the best LED side door lights available. 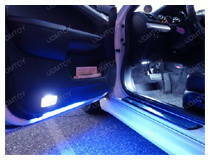 Our products come in a variety of styles and colors, that way you can modify your car, or just upgrade the lights. We offer LED bulbs in white, blue, pink, green, yellow, and red, allowing you to choose a color that matches your personality, or just choose the standard. Not all of our options come in such a wide variety of colors, so you will have to find the items that will work for your vehicle. 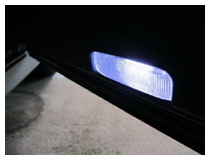 The LED side door lights burn much brighter than the stock lights that vehicles come with, as well as last longer, making them a fantastic investment for any car owner. 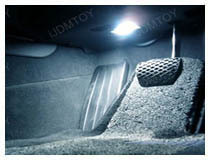 Depending on the product, we have easy plug and play installation, making it a breeze to update your vehicle. For those that are a little more tricky to install, we have guides to help you along the process. We know how important your vehicle is, and we want to ensure that you are able to customize it to your exact specifications. Here at iJDMTOY, we take pride in providing high-quality automotive lights for car owners. If you have any questions about your order or need help finding a specific part, please feel free to contact our customer service representatives, and they will be happy to help you.